2005, New Orleans. 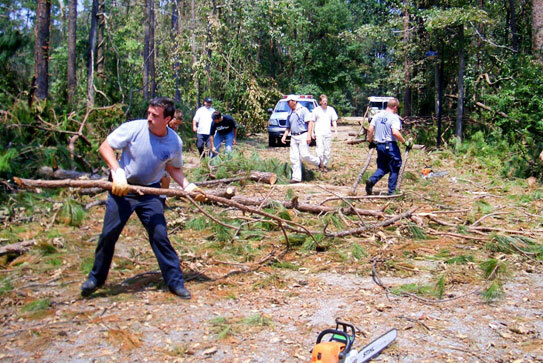 Volunteers help clear debris from the aftermath of hurricane Katrina. Our vision is to reach the lost; to proclaim Jesus Christ as Savior, Redeemer, Sovereign God and Lord; to share His love, His grace, His mercy, His hope, His joy, through His inerrant Word in obedience to His Great Commission. Identifying the unique gifts of the body of Christ both in the United States and abroad, and supporting the local church through discipleship, evangelism, and doctrinally-sound teaching. 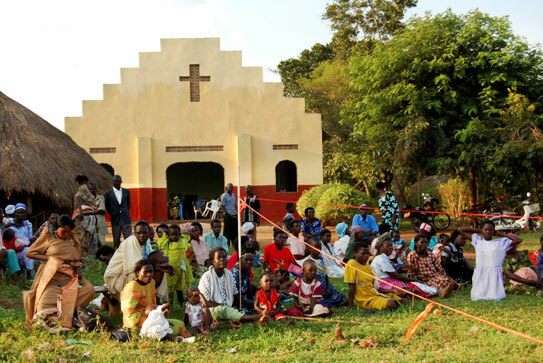 Uganda, 2006. Behold Your God Missions. In support of the local church, providing programming, project development, technical, and fundraising services while pursuing opportunities for long-term sustainability and local ownership, in collaboration with our local constituents. Focusing primarily on the health, education, and livelihood development sectors according to the local context and in alignment with biblical principles while intentionally striving to deviate from the ever-increasing economic prosperity pursuits associated with Western traditions. Identifying organizational capabilities and areas of expertise; participating in action-learning for best practices; engaging in biblically-based reflections of project initiatives; and disseminating lessons learned through publications, courses and training, both in the United States and abroad. Catalyzing professional and effective disaster response efforts of the Christian humanitarian aid sector. Engaging, primarily, in the 3rd phase of disaster relief by pursuing long-term sustainability solutions to the relief to development transition paradigm through engagement with the local church. We will consider a 1st or 2nd phase disaster response, but only if the disaster circumstances, context, and pre-established local relationships reveal a clear necessity to do so. 2007, California. 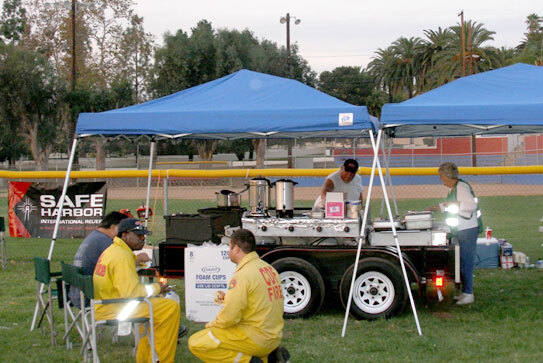 Safe Harbor providing food and refreshments to fire-fighters battling the San Diego fires. 2009, Nayala. 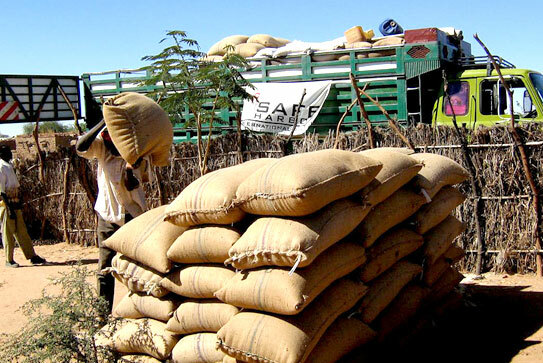 Food distribution taking place outside of a small village. We recognize the dynamic context of the developing world, and initiate projects that are focused, impacting, and sustainable - for the building up of the body of Christ, to the glory of God. We are focused on the mission, vision, and method that God has called us to and pursue initiatives that truly impact the lives of all stakeholders. We plan projects with long-term sustainability in view and seek to understand how we can most effectively partner without creating donor dependency. 2009, Midigo. People gather to watch and partake games put on by Behold Your God volunteers. Due to changing governmental grant objectives and inconsistent donor funding that is often pegged to a volatile global economy, we aim to implement strategies that foster the long-term sustainability of our work, which also allows donor funds to be directed towards expansionary and new project seed financing. Through market-based approaches, Safe Harbor's sustainability initiatives are leading in international development in our aim to combine business and social ventures in a way that obviates a dependency upon external assistance. This does not preclude Safe Harbor from pursuing and maintaining long-term relationships with local, indigenous churches throughout the world. However, we believe that Western-based organizations should be positioned for partnership and support, rather than hierarchical-based donor dependency. 2015, El Salvador. 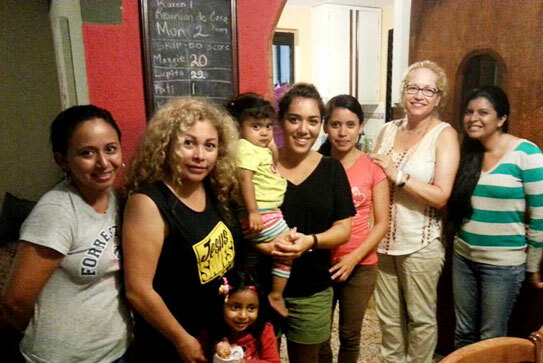 Safe Harbor teaches a basic health workshop to a group of single mothers and their children living in San Salvador. We believe that cultivating relationships is prerequisite to effective ministry, development, training, and relief. We value the gifts, abilities, and perspectives of all stakeholders - beneficiaries, partners, staff, and donors - and desire that each co-laborer is edified in Christ through the ministry of Safe Harbor. In cultivating relationships, we place a particular value upon: trust, understanding, learning, openness, acceptance, truth and love. 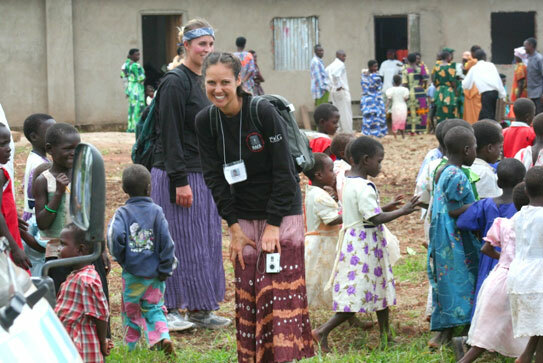 We aim to build trust and develop partnerships with domestic and overseas constituents who are committed to: (1) preaching the gospel of Jesus Christ, (2) pursuing biblically-based and doctrinally-sound teaching, and (3) extending themselves to serving the needs of the poor, in alignment with our statement of faith and 12 Guiding Principles. 2015, Kenya. 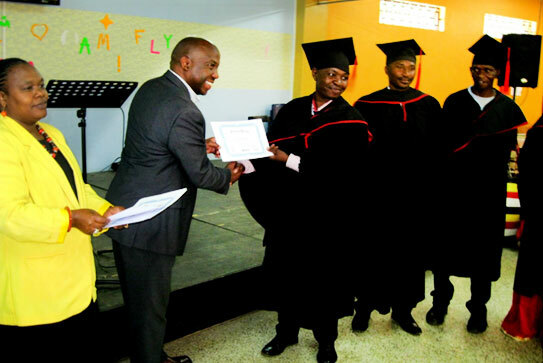 Graduates from the Christian Literacy Program receive their certificates of completion. As stewards of God's resources, we consider it our responsibility to be above reproach in financial decision-making by implementing transparent and accountable financial processes. Whether utilized for programs or overhead, we purpose to direct all resources towards our mission and calling while maintaining financial records that clearly illustrate the use of incoming funds. While organizations differ in how to measure success, our primary aim at Safe Harbor is to be faithful and obedient to Christ's call in serving the poor, knowing that much fruit is borne when we abide in Him. (John 15:5) In light of this promise, we are committed to developing an impact assessment framework for each of our projects as a tool in promoting greater effectiveness and in providing accountability to meeting our stated objectives. Whereas activities, outputs, and outcomes may paint an accurate picture of projects in the field, impact assessment directs us towards the deeper layers of lasting effectiveness and multiplication of efforts. 2015, El Salvador. 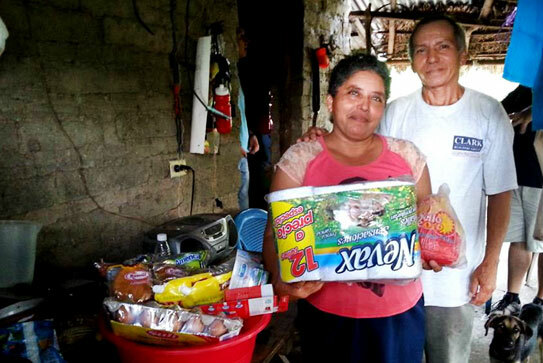 Farmer Tobias and his wife Maria with a gift basket. Motivated by James 2:17-20, we strive to intentionally act upon our faith by coming alongside those in need, regardless of religion, demonstrating the love of Christ in practical ways and sharing the hope of the gospel with the people we minister to. In pursuing intentionality in our words and deeds, we strive to act in a way that is reflective of loyalty, respect, service to others, honor, integrity, courage and humility. We see God's heart and hand concerning the poor and oppressed, and are motivated by the dual calling of proclaiming the good news of Jesus Christ and serving those who are living in poverty. Jesus answered them, "Truly, truly, I say to you, you are seeking me, not because you saw signs, but because you ate your fill of the loaves. "Do not labor for the food that perishes, but for the food that endures to eternal life, which the Son of Man will give to you. For on him God the Father has set his seal." Then they said to him, "What must we do, to be doing the works of God?" Jesus answered them, "This is the work of God, that you believe in him whom he has sent." So they said to him, "Then what sign do you do, that we may see and believe you? What work do you perform? "Our fathers ate the manna in the wilderness; as it is written, 'He gave them bread from heaven to eat.'" Jesus then said to them, "Truly, truly, I say to you, it was not Moses who gave you the bread from heaven, but my Father gives you the true bread from heaven. "For the bread of God is he who comes down from heaven and gives life to the world." They said to him, "Sir, give us this bread always." Jesus said to them, "I am the bread of life; whoever comes to me shall not hunger, and whoever believes in me shall never thirst. "Is such the fast that I choose, a day for a person to humble himself? Is it to bow down his head like a reed, and to spread sackcloth and ashes under him? Will you call this a fast, and a day acceptable to the Lord? "Is not this the fast that I choose: to loose the bonds of wickedness, to undo the straps of the yoke, to let the oppressed go free, and to break every yoke? "Is it not to share your bread with the hungry and bring the homeless poor into your house; when you see the naked, to cover him, and not to hide yourself from your own flesh? "Then shall your light break forth like the dawn, and your healing shall spring up speedily; your righteousness shall go before you; the glory of the Lord shall be your rear guard. "Then you shall call, and the Lord will answer; you shall cry, and he will say, 'Here I am.' If you take away the yoke from your midst, the pointing of the finger, and speaking wickedness, "if you pour yourself out for the hungry and satisfy the desire of the afflicted, then shall your light rise in the darkness and your gloom be as the noonday. "And the Lord will guide you continually and satisfy your desire in scorched places and make your bones strong; and you shall be like a watered garden, like a spring of water, whose waters do not fail. "And your ancient ruins shall be rebuilt; you shall raise up the foundations of many generations; you shall be called the repairer of the breach, the restorer of streets to dwell in. We believe the Scriptures, both Old and New Testaments to be the inspired Word of God, without error in the original writings, the complete revelation of God's will for the salvation of men and the divine and final authority for Christian faith and life. We believe in one God creator of all things, infinitely perfect and eternally existing in three persons: Father, Son, and Holy Spirit. We believe that Jesus Christ is true God and true man, having been conceived of the Holy Spirit, and born of the virgin Mary, He died on the cross, a sacrifice for our sins according to the Scriptures. Further, He arose bodily from the dead, ascended into heaven, where at the right hand of majesty on high, He now is our high priest and advocate. We believe in the centrality of Jesus Christ in the life of the believer. We believe that the ministry of the Holy Spirit is to glorify the Lord Jesus Christ and, during this age, to convict men, regenerate men, indwell, guide, instruct and empower the believer for Godly living and service. We believe that man was created in the image of God, but fell into sin and is therefore lost, and only through regeneration by the Holy Spirit can salvation and spiritual life be obtained. We believe that the shed blood of Jesus Christ and His resurrection provide the only ground for justification and salvation for all who believe, and only such as receive Jesus Christ are born of the Holy Spirit, and thus become children of God. We believe that salvation is by grace alone through faith alone in Christ alone for the glory of God alone. We believe that water baptism and the Lord's Supper are ordinances to be observed by the church in the present age. They are, however, not to be regarded as a means of salvation. We believe the true Church is composed of all such persons who, through saving faith in Jesus Christ, have been regenerated by the Holy Spirit and are united together in the Body of Christ, of which He is the head. We believe only those who are members of the true Church are eligible for membership in the local church. We believe that Jesus Christ is the Lord and head of the Church, and that every local church has the right under Christ to decide and govern its own affairs. We believe in the personal, premillenial, and imminent coming of our Lord Jesus Christ and this "blessed hope" has a vital bearing on the personal life and service of the believer.